We are proud to offer you a broad selection of professional products for men and women to suit your needs. All of our products are 100% guaranteed, along with our services. If you have any questions regarding products carried or not, please don't hesitate to ask. We will be happy to assist you in finding the best products for your hair! We can special order almost any product. ​​We offer a variety of color lines to suit the needs of our clients. Whether you are looking for grey coverage to fashion foward colors, we've got you covered! Our stylist will customize your color to help you acheive the best look for you! We proudly offer Goldwell, Redken, Framesi, and L'Oréal professional color. We are also an ARROJO Ambassador Salon. We are proud to offer these handmade retail items in our salon to support the small businesses in the Lehigh Valley. As a beautiful part of history, greeting cards and letters served as a treasured means of courtship, an expression of friendship and a written history of family events. 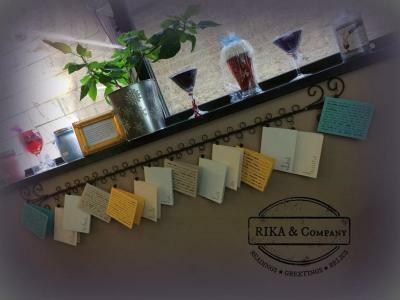 RIKA & Company is committed to keeping that tradition alive through greeting card lines that offer words for signigicant moments and simple days. Add your handwriting and a keepsake is born.